Clearspring organic oils are made from the highest quality organic ingredients which are cold pressed without chemicals to ensure the best nutrition and flavour. Adds a nutty flavour to salads, soups, cold plates and steamed meals. Recommended maximum heating temperature: 100°C. 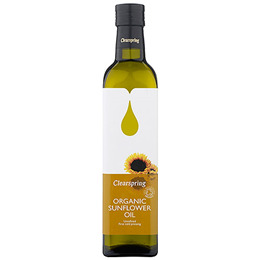 Below are reviews of Clearspring Organic Sunflower Oil - 500ml - Best before date is 30th June 2019 by bodykind customers. If you have tried this product we'd love to hear what you think so please leave a review. Clearspring Organic Sunflower Oil, with its golden yellow colour and distinct, nutty flavour, is a popular general-purpose oil. It is a good source of vitamin E and rich in polyunsaturated fatty acids.